After graduating from the Blair Magnet in May, Anand Oza and Michael Cohen spent part of their summers representing the United States at two different International Science Olympiads. In July, Oza won a silver medal at the International Physics Olympiad (IPhO) and helped the US Physics Team place 11th internationally. 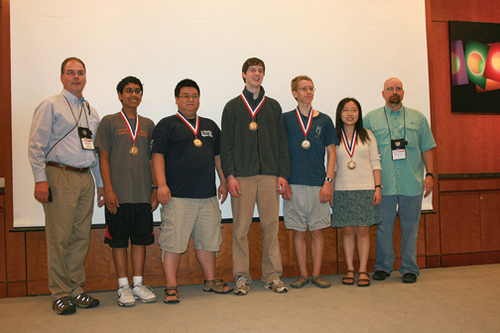 In August, Michael Cohen placed 5th at the International Olympiad on Informatics (IOI), and helped the US team place first overall. The two olympiads' qualification processes are similar, with first a preliminary qualification process that any high school student can participate in that determines who will go to a week-long training camp. For the US Physics Olympiad, there are more exams to determine who gets to travel to the international competition as part of the US team. Oza thought he had a “slim chance of qualifying” even this year, but after semifinals, he felt “pretty confident... that he had missed less than one problem.” To his relief, that confidence was well-placed, and he would be heading to the University of Maryland for the ten-day training camp. At camp, Oza found the problems “much more challenging” than the ones during the semifinals. He admits that he was “pretty sure [he] had not made the travelling team”, but kept “a glimmer of hope” -- and was soon “elated” to find out that he would be going to Zagreb, Croatia for IPhO after all. Oza calls the trip “incredibly fun”. They started off by spending a few days in Budapest before heading to Croatia, where there were many tours and outings besides the competition itself. Oza explains that the competition was “entirely individual”, consisting of a “five-hour theoretical exam... and a five-hour experimental exam”. About 410 students competed, and Oza was 45th, earning him his silver metal. For the USA Computing Olympiad (USACO), the contestants are predetermined, although USACO’s training camp does include some non-contesting students called “Guersneys” (to fit in with their cow theme). Cohen was invited to training camp three times, first in 2008 as a “Guersney,” when he attended a mixture of contests and lectures, and then in 2009 and 2010 as a competing member -- a “Holstein”. Cohen did better than he expected, and explains that his 5th place was largely in part to his performance on the last problem, which “only six people solved”. Like Oza, Cohen’s experience at the Olympiad consisted of far more than just the exams. Each year, the host country for IOI organizes the competition a little differently, and Cohen notes Canada tried to be “innovative”, making problems a little different than usual and setting up “a live scoreboard which the outside world could see, but [the contestants] couldn’t”. He also found the global nature of the competition thought-provoking, noting that “[the card game] Mao is surprisingly international”. Although the Olympiads are a lot of work, for both Oza and Cohen their main motivation was that they find the science genuinely fun. Cohen prefers the USACO and IOI formats in particular because it “primarily focuses on tricky algorithms.” On a basic level, this means that it is not enough to find the answer through any means possible. For instance, theoretically an algorithm to play chess could simply go through every possible sequence of moves, but doing so simply requires far too much time and memory. Instead, IOI designs its problems and its scoring method to force contestants to optimize their solutions. Not only so, both Olympiads are also designed to help contestants find other motivated people and friends with similar interests. According to Oza, there was “a lot of free time to meet the other teams, because the IPhO competition lasted 10 hours even though the event was a whole week. Overall, Cohen and Oza both called the experience “amazing”. Oza points out that “a year ago, I never would have expected to make it to camp, much less the travelling team, so I am really grateful that I had this opportunity.” Although college means that it is now time to move beyond high school competitions, Oza and Cohen are both planning to continue in their respective fields. Oza is planning to major in math and physics, and Cohen is planning to major in computer science and math, both at the Massachusetts Institute of Technology. No doubt the knowledge, inquiring nature and dedication they cultivated in preparing for the Olympiads will serve them well in college and their future careers.